upcoming recruitment tests like SBI Recruitment,IBPS,SSC (Staff Selection Commission),RBI Recruitment,RRB(Railway Recruitment Board),Postal,Insurance and other state level recruitment tests. 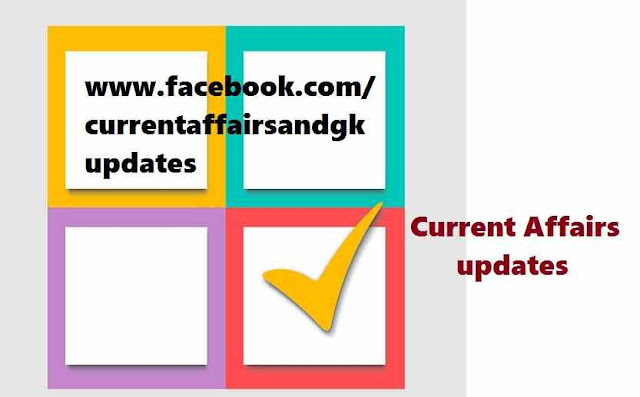 Current Affairs updates till 17 August 2015 are given.Updates on 16 August and 17 August are covered. 1.Indian Archer Abhishek Verma won Gold medal in the World Archery Championships in Poland. Verma took the gold medal at the Compound men's individual event. 2.Taj Mahal becomes first Historical Monument to have it's very own Twitter account.Taj Mahal made it's twitter debut on the Independence day. 3.GVK-Emergency Management and Research Institute (EMRI),which operates 108 Ambulance services will launch operations in Srilanka and other Countries(According to Sources). 4.Prof.Mustansir Barma,former Directror of Tata Institute of Fundamental Research,Mumbai won the prestigious Gujar Mal Modi Award for Innovative Science and Technology for the year 2015.He was awarded for his commendable contribution in the field of Science and Technology. 5.The Indian siblings 5 year old Kandarp Sharma and 8 year old Ritwika have successfully climbed the Kalapthar peak to reach the base camp of Mount Everest,becoming the youngest climbers to reach the destination. 6.Saina Nehwal (India) settles for Silver medal after Final's loss to Carolina Marin at World Badminton Championship (Spain). 7.PM Narendra Modi returns home after successful visit to UAE. PM Modi also addressed the Indian diaspora at Dubai Cricket Stadium.The Prime Minister visited the UAE after 34 years.The last Indian PM to visit the UAE was Indira Gandhi in 1981. 8.Indian Wrestler Ravi Kumar won Silver medal at Junior World Wrestling Championships in Salvador de Bahia,Brazil.Ravi Kumar won this medal in the 55Kg freestyle. 9.Indian-American in Houstan,Texas paid tribute to Mahatma Gandhi by unveiling his bronze statue at the entrance of "Little India", an area off Hillcroft Avenue in Texas.The monument is a marble structure bearing a bronze engraving of the Mahatma Gandhi.